The US-developed GLOBUS II radar system serves as part of the 29-sensor, global space surveillance network that provides critical data to US Strategic Command. Located in Vardo, Norway, and operated solely by Norwegian personnel, GLOBUS II radar has proven effective at identifying more than 10,000 man-made objects orbiting the earth. The radar is sheltered by a composite fabric cover manufactured by Saint-Gobain Performance Plastics (Merrimack, New Hampshire). Fabricated in sections joined via hot bonding, the cover is secured to the structure that houses GLOBUS II but otherwise hangs above the radar so that no direct contact occurs. Pressurized air (with effects similar to those of a balloon) keeps the cover inflated over the radar. 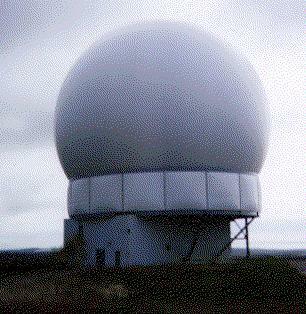 The HAVE STARE radar, originally located at Vandenberg Air Force Base in California, is an X-band 200 kw tracking radar that came on line at Vandenberg during 1995. It can detect small debris in the 1 to 10 cm range, depending on altitude. HS is a high resolution X-band tracking and imaging radar with a 27 meter mechanical dish antenna. The HAVE STARE (HS) radar was transferred from the intelligence budget in FY93 at the direction of Congress. The Air Force identified a requirement for the HS system and programmed funding in this program element to complete development and to deploy the system. In March 1995, the system completed a highly successful DT&E at the Vandenberg AFB test site. In November 1995, AFSPC selected an overseas location for system beddown. Anticipated IOC at this location is FY00. The radar remained in place at VAFB through FY98 -- during this time the contractor integrated and test a major software upgrade which will enable the system to support AFSPC's Space Surveillance mission. In conjunction with this latter effort, the Program Office actively supported NMD test demonstrations during ICBM FOT&E launches and perform X-Band Analysis Studies for NMD-Sponsor. As envisioned in 1996, the defensive system would capitalize on existing and planned improvements to strategic sensors and battle management systems. The DSP [Defense Support Program] satellite program will detect missile launches against the US and cue upgraded early warning radars. These radars will generate track information for the battle management center at Cheyenne Mountain Complex in Colorado, which will disseminate the track info to the interceptor site for launch and guidance. Ground-based X-band dish antenna radars will provide refined tracking data to help discriminate reentry vehicles from other objects. The X-Band Dish Radar was based on HAVE STARE, an existing X-Band Dish Radar. It would require modifications to perform NMD mission and was a low-cost alternative for C1 architecture. In May 1997 Electronic Systems Center, Surveillance and Control Systems sought [SYN# 0019 19970527\B-0011.SOL] support for short-fused NMD efforts being added to an existing contract to provide the Air Force (AF) and Ballistic Missile Defense Organization (BMDO) with timely answers on the ability of the X-Band Dish radar to perform the required NMD mission. The efforts anticipated include collecting and analyzing X-Band radar data from possible AF and BMDO sponsored VAFB launches [Jan 98 -- Sept 98], incorporating and testing additional object classification algorithms [Feb 98 -- Sept 98], and other support tasks associated with X-Band participation in NMD test activities through FY98. It was considered that Raytheon was the only qualified source with the technical understanding of the HAVE STARE radar being used as the X-Band surrogate for data collection and as the basis for developing a LESFOV design suitable for performing the NMD mission. Furthermore, Raytheon was the only source that has X-Band hardware at VAFB and the in-depth knowledge required for the integration of NMD algorithms into the existing system in a timely fashion to be able to support possible BMDO and AF test and analysis for FY 98 launches. The National Missile Defense (NMD) deployment readiness program scored a success on 15 January 1998. During the test, some NMD surrogates and a number of support resources were employed. These included an early warning radar and X-band dish radar (HAVE STARE on the West Coast), Global Positioning System, Launch Support Services and Up Range Tracking (Western Test Range, Vandenberg), Mid-Range Tracking (Hawaiian Islands), Down Range Tracking and Interceptor Launch Support Services (Kwajalein), SMDC's Airborne Surveillance Testbed, and the Range Interface Test Equipment. On June 24, 1998 Raytheon Co., Marlborough, Mass., was awarded a $23,552,430 face value increase to a cost-plus-award-fee-contract to provide for relocation of the HAVE STARE radar system from the test site at Vandenberg Air Force Base, Calif., to its final operating location at Vardo, Norway. Estimated contract completion date is September 2000. Solicitation issue date was November 10, 1997. Negotiation completion date was May 29, 1998. Electronic Systems Center, Hanscom Air Force Base, Mass., is the contracting activity (F19628-91-C-0057). With site preparation at classified overseas operational deployment location planned to beginn in 1996, HS deployed in mid-1999 as a dedicated space surveillance sensor to support the mission of space object catalog maintenance of deep space objects and mission payload assessment. HS retained its original design features and their inherent potential to support other missions. The "classified" location is the Norwegian military intelligence facility in Vardo in Northern Norway (close to the Russian border). Norway and USA jointly financed the project ehich is called "Globus II." Work on the 132-foot-tall radar dome started in April 1998 and be completed in late 2000. It will be operated by Norway's Military Intelligence Service. This system is currently in the EMD phase leading to an IOC in FY00. If needed, other existing forward-based radars (such as Cobra Dane or HAVE STARE) could also be used to support NMD systems. HAVE STARE uses Ada83, with displays and controls functionality distributed across several workstations, and track support loops distributed across several general purpose processors with vector processors connected for signal processing. Other distributed processing includes specialized radar control and communications single-board computers, with signal processing performed by several processors within a single "data processor" machine. The HAVE STARE architecture thus consists of the single-board computer controlling the radar, another single-board computer for message processing, a multiprocessor "data processor" for the track loop, mission control, signal processing and data recording, and workstations for displays and controls. The deployment and networking of additional sensors supports the MDA goal of using a layered sensor architecture to provide a more robust BMDS. Target tracking and eventually discrimination will be performed by upgrades to an existing Large X-Band Dish radar and procurement of two smaller X-Band Dish Radars to be used in conjunction with FBX-T radars. Pairing the FBX-T radars with X-Band Dish Radars (depending on the region being covered) significantly increases the amount of time available for tracking and eventually discrimination. This strategy along with upgrading an existing Large X-Band Dish Radar will eliminate discrimination gaps for most missile trajectories emanating from specific rogue nations, and thereby increasing BMDS effectiveness. The FBX-T's will provide BMDS precise acquisition and tracking information on ballistic missiles from boost into midcourse, providing the potential for BMDS weapons to extend their effective range beyond local sensors by using more sophisticated engagement strategies. The extended coverage provided by the adjunct dish radars will further enhance the capability of the BMDS to defend the United States and our allies, friends, and deployed forces from ballistic missiles of all ranges in all phases of flight. Upgrades to the existing Large X-Band Dish Radar will include software and signal processing enhancements to be completed for Block 2008. Upgrades will be based on SBX functionality and will include tracking and discrimination algorithms and connectivity capabilities. Procurement of the additional X-Band Dish radars will begin in FY07 with delivery in Block 2008 and Block 2010 respectively. Contractor Logistics Support will be provided to operate and sustain the radars. Support will include radar site survey, site preparations, personnel training, and radar system maintenance. An acquisition strategy will be developed in FY07 to upgrade existing Large X-Band Dish radar and to acquire two X-Band Dish radars for the FBX-T's, a Block 2008 and Block 2010 asset. Upgrades to the existing Large X-Band Dish Radar will include software and signal processing enhancements to be completed for Block 2008. Upgrades will be based on SBX functionality and will include tracking and discrimination algorithms and connectivity capabilities. Procurement of the additional X-Band Dish radars will begin in FY07 with delivery in Block 2008 and Block 2010 respectively. Contractor Logistics Support will be provided to operate and sustain the radars. Support will include radar site survey, site preparations, personnel training, and radar system maintenance. The Missile Defense Agency will buy two X-band, dish-type systems over two years [by 2007] as auxiliaries for national and theater missile defense purposes. MDA held an industry briefing May 24 to lay out its requirements for what it calls "adjunct" sensors. In mid-2008 AFRL performed an on-site pulsed-thermography inspection of the GLOBUS II radar cover, successfully demonstrating the utility of this new inspection technique and training site technicians in the process. As a result of AFRL's engineering expertise in nondestructive inspection (NDI) and thorough analysis conducted throughout the GLOBUS II program effort, the ongoing safe operation of the GLOBUS II radar system remained assured. The efforts as of 2012 of Eglin, Haystack Ultra-wideband Satellite Imaging Radar (HUSIR), Ground-based Electro Optical Deep Space Surveillance (GEODSS), and Globus II are representative of sensor systems upgraded in the SLEP project. Space Situational Awareness (SSA) is knowledge of all aspects of space related to operations. As the foundation for space control, SSA encompasses intelligence on adversary space operations; surveillance of all space objects and activities; detailed reconnaissance of specific space assets; monitoring space environmental conditions; monitoring cooperative space assets; and conducting integrated command, control, communications, processing, analysis, dissemination, and archiving activities. Program Element 0305940F, Space Situational Awareness Operations, fields, upgrades, operates and maintains Air Force sensors and information integration capabilities within the SSA network while companion program element 0604425F, Space Situation Awareness Systems, develops new network sensors and improved information integration capabilities across the network. Activities funded in the SSA Operations program element focus on surveillance of objects in earth orbit to aid tasks including satellite tracking; space object identification; tracking and cataloging; satellite attack warning; notification of satellite flyovers to U.S. forces; space treaty monitoring; and technical intelligence gathering. Hemmelig norsk atomkappløp Norske myndigheter holder hemmelig at Norge er blitt en brikke i et nytt våpenkappløp. Dette skjer på grunn av byggingen av den nye radaren Globus II i Vardø. Kan kobles til rakettforsvar Bergens Tidende : 27.02.00 -- Den nye radaren i Vardø kan med enkle grep og på kort tid bli svært nyttig for USA i et nytt rakettforsvarssystem, sier John Pike i Føderasjonen av Amerikanske Forskere (FAS) til Bergens Tidende. New radar in Vardo makes Norway bomb target BY INGE SELLEVÅG - 13 May 1998 -- The Have Stare radar according to American experts could have a potential role in an operational missile defense, providing mid-course discrimination of ballistic missiles launched from rogue states like Iraq or Iran against targets in the United States, the newspaper Bergens Tidende reported. The Globus II Radar and Norwegian Surveillance Activities in the North 25 February 2000 - Due to the recent media interest in the Globus II radar, the Norwegian Minister of Defence, Mrs. Eldbjørg Løwer, wishes to issue the following statement. Hard fight about the Vardo radar BY INGE SELLEVAG Bergens Tidende 06 June 2000 -- Strong forces in the United States Air Force fought to use the Vardo radar technology in the US national missile defense. The fight continued also after it was announced that the radar was to move to Norway.